A sharps container is filled with used medical needles and any other sharp medical instruments such as IV catheters and surgical blades. This industry changing device was developed in 1979 by a UK company named Frontier Plastic Ltd. 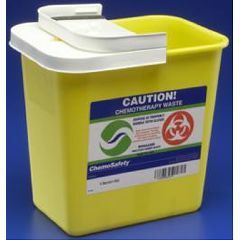 There was a need for a safe way to dispose of clinical sharps and thus, the first sharps container was marketed in 1980. Everyone is at risk without the proper disposal of sharps items including janitors, caregivers, children, and even pets. Used needles are dangerous because they can injure people, spread germs, and spread deadly diseases. There are many general safety rules that everyone needs to abide by. You should never throw loose or used needles into the garbage, never flush used needles down the toilet, and never put needles in recycling containers. You should always use a specific container designed for the disposal of sharps and dispose of it properly. Since they were first created, these containers have evolved into a variety of shapes, sizes, and colors that all cater to your specific needs. 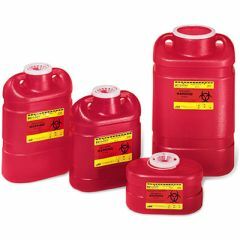 Sharps containers are typically seen in medical centers in the United States as a red container with a biohazard symbol in the front in various sizes. Red has been the standardized color for United States while the color yellow is the common color in other countries. Our brands such as Invacare, Sharpsafety, Kendall, BD Becton, Medline, and Sharps Compliance all provide the different colors and sizes. The last important fact about sharps is the physical disposal of the container. There are many approved facilities in your community that are permitted to accept and dispose of sharp containers properly. Some of these approved facilities are drop off collection sites, “special waste” pickup services, syringe exchange program, and “household hazardous waste” centers. 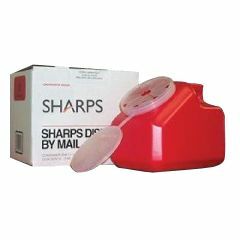 However, a new and convenient way to rid of your sharps is the sharps disposal by mail systems. The approved containers are compliant with federal, state, and municipal regulations. They come with everything you need to ship the container back to an approved location. They eliminate the need of unnecessary pickups by special services. There are no contracts and it is convenient to dispose when you are ready. This brings ease to ones who are unable to leave the house or only dispose of a few containers per year.